Crash Test, the local comedy show of Rob Huebel and Paul Scheer goes on a bus tour of LA. Like the many bus tours of LA it...I just wanna stop writing about how badly this went. I'm a big fan of Rob and Paul and nearly died of laughter at their real Crash Tests and performances through LA's comedy clubs. 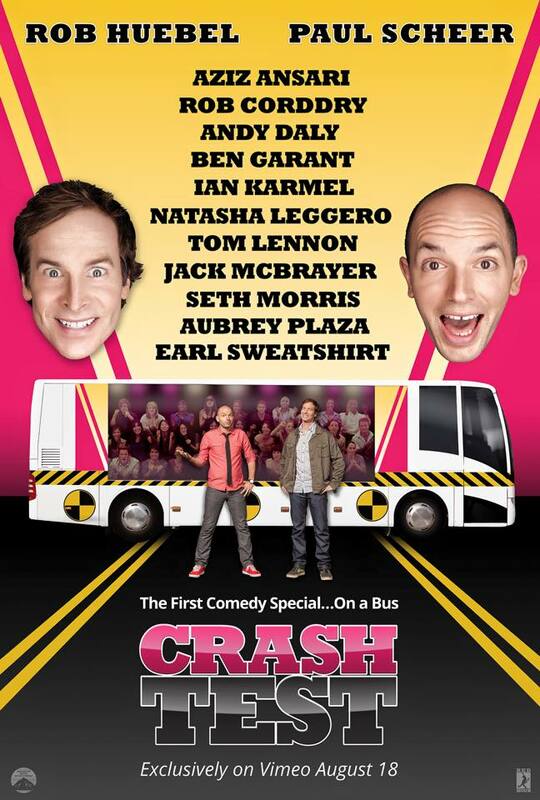 Ughh, it just fails to be as funny and was shot with such little effort, though money was wasted a expensive bus. Think about how bad the failed pilot has to be for me to write about me assuming the bus cost too much for it. Billed as a comedy special it has to have been a failed pilot for Comedy Central. You can easily piece together from Paramount distributing this- only through Vimeo -and Paramount being visited on the tour. Paramount and Comedy Central are both subsidiaries of Viacom. The look of it and the fake promise of another episode. Paul and Rob tour LA on a costly looking bus with their giant heads embossed on it. Their audience, facing one side of the bus, watch as Rob and Paul berate people on the street with bad jokes and planned meetings with comedians. These top talent comedians are doing some of their worst material. Thomas Lennon and Ben Garant reprised in their roles from Reno 91 and Jack McBraye did get some laughs. What was left was a mess of bothering people on Hollywood and Highland, a schitck used too much by Jimmy Kimmel and probably a real fun evening for Paul and Rob who seemed like they could care less about how funny they were being. For some unknown reason Andrew Daily is the voice of the Bus, as Bussy? Andrew Daily can be funny when he wants to, that happens to be never when he's on television. At comedy clubs though, genius. 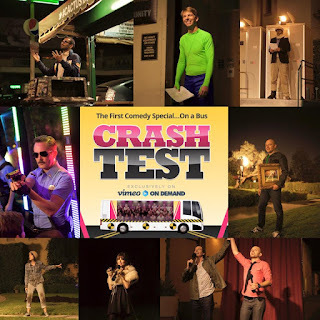 Whatever attempt it was at making Crash Test a show was a failure, a massive failure. For just being nothing that new or exciting or even really connecting with LA. They passed by places, never really had improvised interactions that landed any laughs. Crash Test might have just been a birthday wish of Paul and Rob they got to pull off and have the studio pay for.